Christmas decorations are colorful, twinkling and festive. One of the most widely-seen holiday decorations are miniature LED lights, which you can string on trees and bushes, homes and Christmas trees. These lights are available in multicolored, one color or white. Multicolored lights are usually pretty standard, with only a few choices for colors. 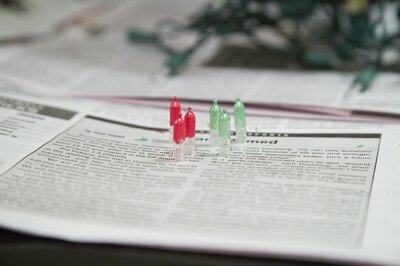 Instead of purchasing premade multicolored lights, purchase clear mini bulbs and paint them yourself. Although somewhat time-consuming, this project will end with beautiful, customized lights that will match the rest of your holiday decor. 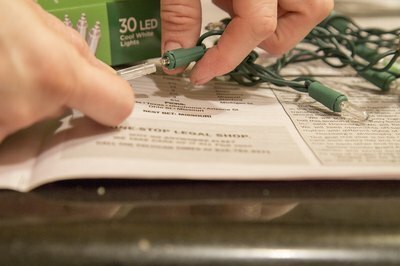 Remove the bulb caps that you want to color from the cord by gently pulling the clear bulb caps with your thumb and forefinger until they pop off the cord stem. 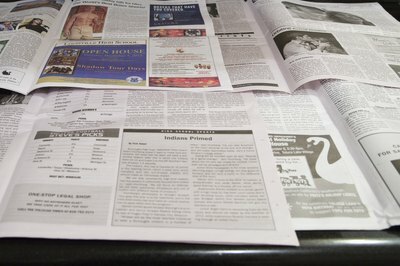 Spread newspaper onto the floor or a large table to create a drying area. 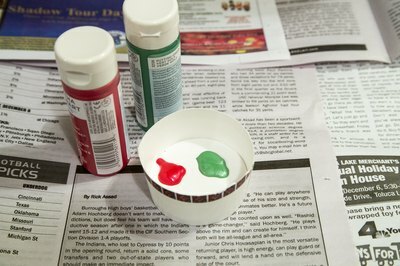 Squeeze a small amount of glass paint onto the palette or into a small, disposable cup. Keep in mind that very little glass paint will be needed to paint each individual bulb, so only squeeze out a small dollop at a time to keep the paint from drying. You can also dip the paintbrush directly into the jar of glass paint. Use a very small paintbrush to apply a thin layer of glass paint to each bulb. Cover the mass of the bulb, or you can paint just the tip of the bulb for more subtle color. Avoid painting around the bottom of the bulb; this area must fit back into the bulb stem, and adding a layer of paint will widen the bulb slightly. 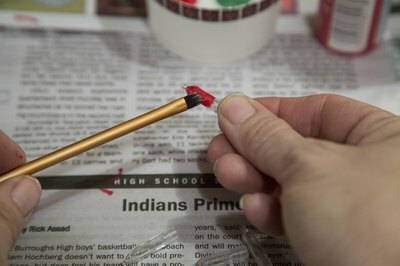 Carefully set each painted bulb pointed-side up onto the newspaper as you finish painting. Let dry between thirty minutes and one hour. Reattach the bulb caps to the cord. Do this by gently pushing the bulb caps back into the bulb stems. 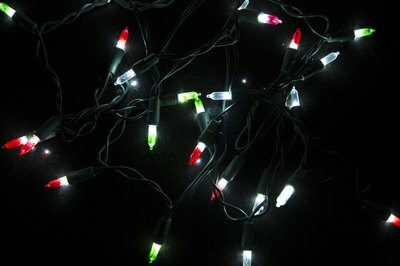 Do not use anything other than glass or special light bulb paint to color Christmas lights. Inappropriate paint can be a fire hazard or emit dangerous fumes when heated.